← Are You Qualified to Be an American? I have at least 100 pairs of nail clippers! Well, I am exaggerating a little; however, I did find 7 pairs as I was cleaning this week. Why, you ask, do I have so many pairs of clippers? Well, maybe I wanted one for every toe. Who is to say? Anyway, as I was collecting them and putting each pair in the drawer where I keep the nail clippers, I could not help but wonder if they would be there the next time I needed them. I believe that is one of the reasons I have so many. Whenever a pair was needed, I would hunt and hunt. Finally, I would just go out and buy a new pair. 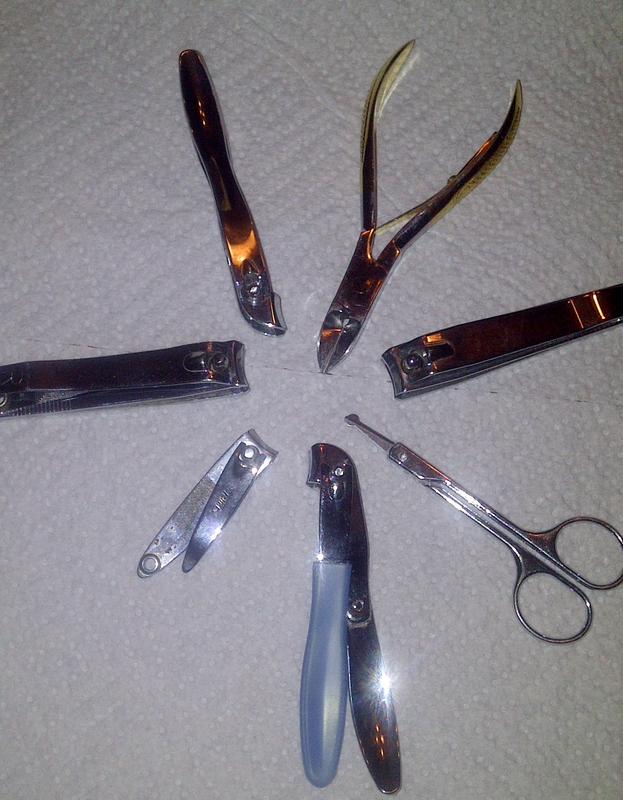 I am sure that the maker of nail clippers has made a bundle off me. It seems that the original inventor of nail clippers is unknown, but a guy named Valentine Fogerty has the first patent for an improved version in 1875. Then, a man named William C. Edge (hmmm…interesting name) improved the clippers again in 1876. I guess these things keep getting better, and every few years we can expect a new and improved version. This is good; because I am sure, I will need a new pair as soon as I misplace the old pairs. Why are they called pairs, anyway? It is not as though I am getting two of them. Both sides of the clippers must work together. I suppose one can think of them as a married couple. Two individuals, who work together at the same time to make a life together. Married couples are called pairs, so maybe that is why nail clippers are named pairs. These pairs come in so many different sizes. I have a giant pair that I could have melted down to make a whole set of sterling silverware. Then I have a teeny-weenie pair that you would use for a baby and every size in between. I guess if there was a toenail emergency I would be ready. These items are a necessity for every household. Moreover, they can act as a stand-in for situations other than for clipping nails. I have used them to cut the thread when I was sewing, to trim the fringe on the old towels, and to splice speaker wire before they were wireless. I probably should keep the nail clippers in my toolbox, and then I would know where they were when they were needed. A life without nail clippers would be a sad one. People would be walking around with long, spindly toenails like those that you see on Ripley’s Believe it or Not. Yuck! I guess I just need to put a tracker system on my personal nail clippers so I do not lose them. I wonder how other people are able to keep track of their nail clippers. Do any of my readers have a suggestion? Please help. Posted in Living the Life and tagged beauty, giant pair, Grandmother Musings, Lost items, Nail Clippers, Nails, postaday, Toes, Useful Tools, Uses for nail clippers. Bookmark the permalink. i also have the same problen, never able to find the recent one . Lol!Very well written, indeed. Good idea, the chain around my neck! It could be my new necklace. LOL! A invention of nail clippers has created so, so much convenience for us. I didn’t know the first patent was in 1875. Thanks! But I can never find one when I need one! Love your post. This is my current pet peeve. No one put the clippers back where they belong!!! Good to know history of how things happened and how we defined our needs because of a specific invention. Keep every thing related to nail treatment in a cosmetic bag and put in a drawer that is only used by you. Mine live in my handbag, with a file, so wherever I am I can clip off a rough bit. How could you live without them? Decadent nail tip: you know how you are careful when you have just varnished your nails, nothing must touch them? Well, be like that all the time. Voila, beautiful nails.